You can skim the scum from your boil, but the difference it makes — if any— is going to be small. When your wort first comes to a boil, the foam rises to the top of your kettle and often has darker brown clumps of “scum” amidst the light tan foam. Likewise, during fermentation, the white/tan kräusen often has dark clumps in it. The Germans call this braun hefe (literally brown yeast). Many homebrewers wonder if they should skim the boil scum and/or braun hefe. Before answering these two questions, I should point out that there are techniques in brewing that clearly lead to demonstrably better beer and there are techniques whose influence on quality is much smaller (fading into undetectable). In both these questions, the latter is definitely the case. The short answer to this question is that a few breweries skim (at one or both stages), but most don’t. Skimming is not something that is going to make or break the quality of your beer. In fact, you may not even be able to tell a difference. Still, let’s take a look at each case a little more closely, in order to get a more complete answer. When your wort comes to a boil, the brown “scum” that flecks your foam is composed of coagulated proteins and polyphenols. (Polyphenols are a class of compounds, found in plants, that include tannins. They come from the husks of the malt and from the hops — and in the case of spiced beers, any other plant material aded to the boil.) This “scum” is insoluble, although prolonged boiling can break it down somewhat. Left alone, it will end up at the bottom of the kettle with the rest of the trub (hot break, cold break and hop debris) and be left behind in the kettle. Most commercial breweries don’t skim. A few German breweries do with the idea that the material contributes a harsh character to the wort, but plenty of breweries brew delicately-flavored beers without skimming this material. At home, with an open kettle, it’s easy to do. Just take a clean strainer and run it through the foam early in the boil. If you want to, go ahead. It’s not going to hurt anything. However, it is not likely to have a noticeable impact on your beer, either. When fermentation kicks into gear, the kräusen atop your fermenting beer will — like the foam in your kettle — be flecked with some darker material. This dark stuff, called braun hefe, is intensely bitter, and not in a pleasant way. In most commercial breweries, the braun hefe eventually falls into the beer when the kräusen collapses and ends up in the yeast at the bottom of the fermenter. The braun hefe is left behind when the beer is transferred to the bright tank (a vessel similar in purpose to a secondary fermenter). A few commercial breweries do make an effort to remove this. Anheuser Busch’s fermenters have false ceilings built into them. When the kräusen rises during early fermentation, the braun hefe sticks to the false ceiling and is thus separated from the beer when the kräusen falls. They do this because they believe the braun hefe lends more bitterness to the beer and also a harsher edge to the bitterness. In homebreweries, the braun hefe is sometimes removed if the kräusen reaches the top of the fermenter, or if kräusen is expelled through a blowoff tube. 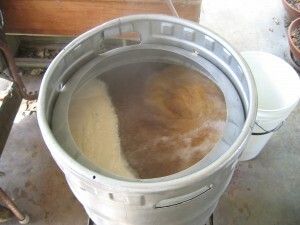 In a bucket fermentation, it can be skimmed with a sanitized strainer. As with skimming the boil scum, skimming the braun hefe is not going to dramatically change the character of your beer. It may be slightly less bitter, with slightly less of an edge, but then again there are plenty of delicate beers that are brewed without going to this length. Skim if you want to, but don’t expect a big difference in your final product. The brew has been fermenting for 6 days now in temperatures of around 23 to 25 degrees centigrade…It is an Amber Ale with all the right ingredients…There is a creamy type layer floating atop the brew…SG just about right (1012) The smell has a slightly sour tinge to it…The taste is also a little sour…Is this the end of the brew…do I throw it away or do I rack the whole thing into another vessel? Give the beer time to condition and sample it again. Never dump a beer until it is finished and you are sure that something is wrong.